This Smart Board activity created by Heather Bates, SLP was designed to help reinforce vocabulary along with reasoning and inferencing skills. There are a total of 89 slides in this activity. The first 2 slides are for informational purposes. 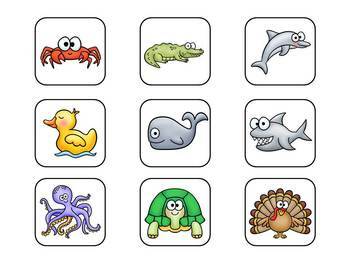 Slides 3-84 contain clues and pictures of a given animal (clues then animal picture alternate between slides). 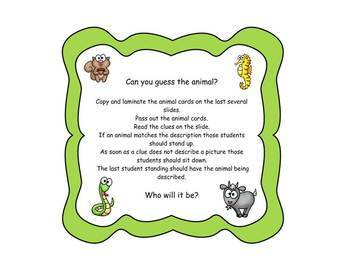 The 1st slide in a pair provides 3 clues that you can reveal one at a time to see if your students can predict what the given animal is going to be. The first clue is always where the given animal lives. 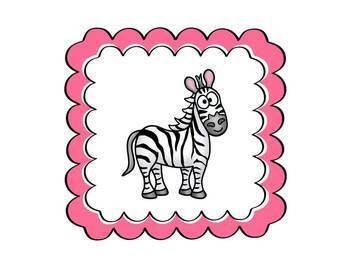 As the clues are revealed the correct animal choice narrows down. When the last clue is revealed your students should have a pretty good idea of what the animal will be on the following slide. 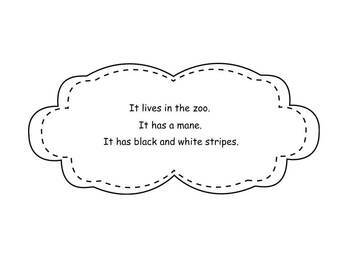 Slides 85-89 contain small pictures of all the animals in the activity that you can copy and laminate to use during this activity if you choose. Your students will love the amazing graphics from Pink Cat Studio (www.pinkcatstudio.com) and borders from www.mycutegraphics.com. You will be amazed at how engaged your students will be and the active participation you will elicit from you students.